This is a sponsored post written by me on behalf of Downy Wrinkle Releaser Plus. All opinions are 100% mine. The first day of school can be overwhelming…there are traditions, nerves, picture taking and more. Here are some ideas to help you enjoy the morning and overcome the first day of school rush! Prep your lunches ahead of time. 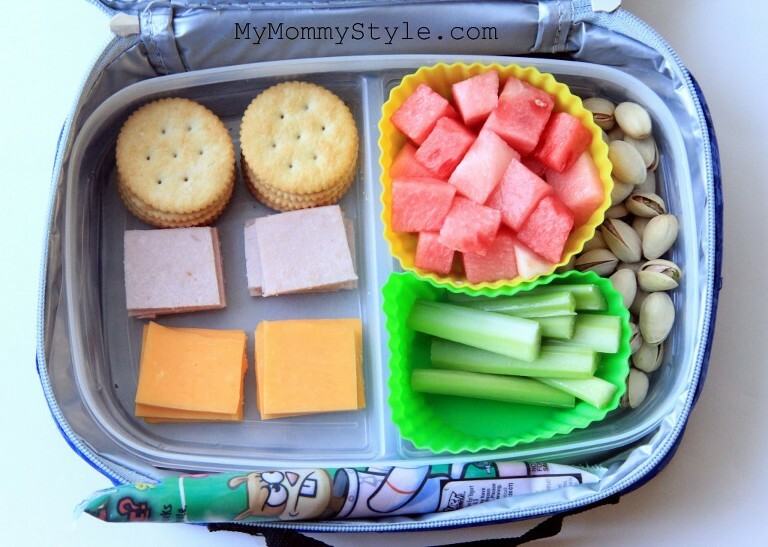 If you have a child who likes at home meals more than the school lunches get them involved with the prep! Have items stocked in the fridge that they can easily grab and go. We have tons of healthy lunch ideas here on the blog. Lay clothes out for the night before or even prep them for the whole week. It seems like things always sneak up last minute with kids. Maybe it is a homework assignment they have forgotten, breakfast they still haven’t eaten, or lost shoes. Consider having outfits laid out the night before so that the guess work of what to wear is taken out of the equation. I love the sorted hanging bins, labeled hangers, or clear drawers so your child knows exactly what to wear ahead of time. Use last minute hacks to get wrinkles out of clothes. I am guilty of not getting around to laundry when it is fresh out of the dryer. It is life people! An unfortunate result of this behavior is wrinkled clothing and feeling like you have to start all over again. With Downy Wrinkle Releaser Plus you can speed up this process in no time without the need of washing them again or ironing them. The rules are simple. Lay clothing out flat on the ground, spray both sides until slightly damp, tug on the wrinkles, and hang to dry! That’s it. Depending on the fabric that you are working with you will see the wrinkles fall right out or it may take a little bit longer. This would also be a great product to have on hand for travel (bring the travel size), use on curtains, throw pillows and more! This t-shirt’s wrinkles fell out instantly…. These pants needed a little more time because they were thick denim. I hate when a pant leg gets stuck inside out and the Downy Wrinkle Releaser Plus worked like a charm! 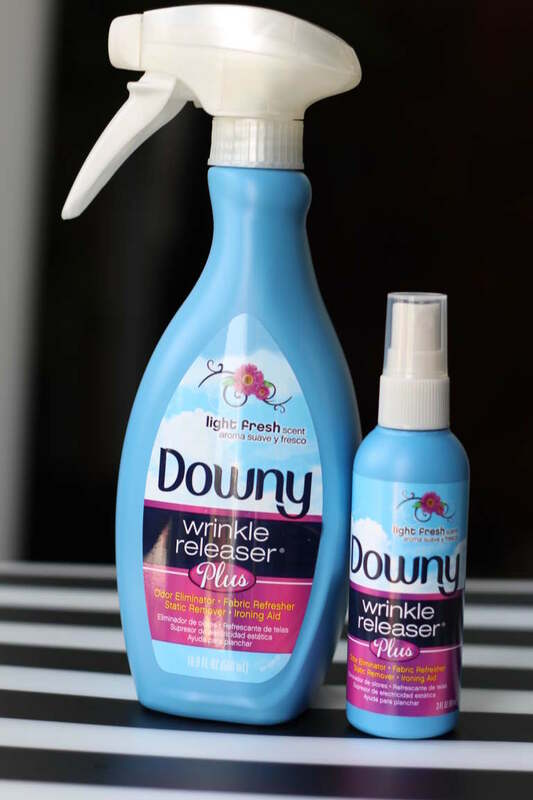 You can pick up this Downy Wrinkle Releaser Plus at most local grocery stores, find a store near you. Use these Downy coupons and offers to save some cash! Use a blank chalkboard for those first/last day pictures and edit later. Every year I love to take pictures of my children on the first and last day of school with this DIY chalkboard I made a long time ago. (It is made from an old picture frame and I had a local hardware store cut the chalkboard to size). I used to take the time to write in my own handwriting “Jackson’s first day of ______ grade.” Now I simply leave the board blank and add the text later through free apps. The writing takes no time at all and it looks much better than I could write by hand. Added bonus, you can have one sibling hold it and then the other without a redo or printing something new out. Take back to school pictures before the first day of school. I personally have not done this yet, but I have heard of others taking their “first day of school” pictures before school even starts! This would definitely take the stress off of getting there early or finding a spot among the chaos to get the right shot. I do think it is a good idea to meet your child’s teacher before school begins, especially if you have a child who is nervous about school. Typically teachers are required to be in their classrooms a week before school starts, so this could be the perfect time to stop in and say hi. Offering for volunteer hours, donations to the class, or giving an encouraging word to the teacher is always appreciated too. I feel like oftentimes I cannot fully express the loving words I want to say on a busy first day of school morning. Adding a little love note in their lunch does the trick and is sure to put a smile on their face. I don’t always add something sweet to my child’s lunch but on special occasions it always perks up the day. Make traditions simple and focus on the moment.